The Future of the Ivory-Billed Woodpecker Even before it disappeared in the 1940s, the ivory-billed woodpecker had near-mythical status. Christopher Joyce reports on what scientists are planning now that they believe they've rediscovered a species long thought extinct. 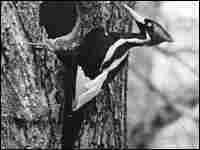 Even before it disappeared in the 1940s, the ivory-billed woodpecker had near-mythical status. Christopher Joyce reports on what scientists are planning now that they believe they've rediscovered a species long thought extinct.